Brookfield Central golf coach Brian Scrobel had known the Anderson family, all avid golfers, for several years. Carl and Kim and their three boys, Evan, Eric and Jack. Scrobel had coached the two older brothers, but he wasn't sure he would get a chance to coach Jack, the youngest, who played basketball his freshman year. "We had a golf unit at Wisconsin Hills and I could see Jack was really good," Scrobel recalled. "But he was into basketball. He had very little interest in golf. But after the summer of his 8th grade year he caught the bug and got really good, really fast." Jack remembered he started golfing with his dad when he was 8 years old, but he admitted he didn't get into it. "But during spring break of my 8th grade year I played as much as I possibly could. And I became a regular on varsity as a freshman." "I could spend time golfing with my dad, with his friends too," Anderson said. "I could meet more people. I enjoyed being outside. I really like being outdoors." Scrobel was asked was he surprised that he suddenly made the team as a freshman after not deciding to go out until the last minute. "He had a great work ethic and support to do what he wants to do," he said. "I watched the passion develop and then I knew he was going to be very good. And once the passion developed, I knew he was going to be very good RIGHT AWAY." Photo by Alan Herzberg, SportsPhotosLLC --- Jack Anderson made it to state with the Lancers his freshman and sophomore seasons and this year he is Brookfield Central's top returning starter. Scrobel was right about Anderson, as he became a starter his freshman year. 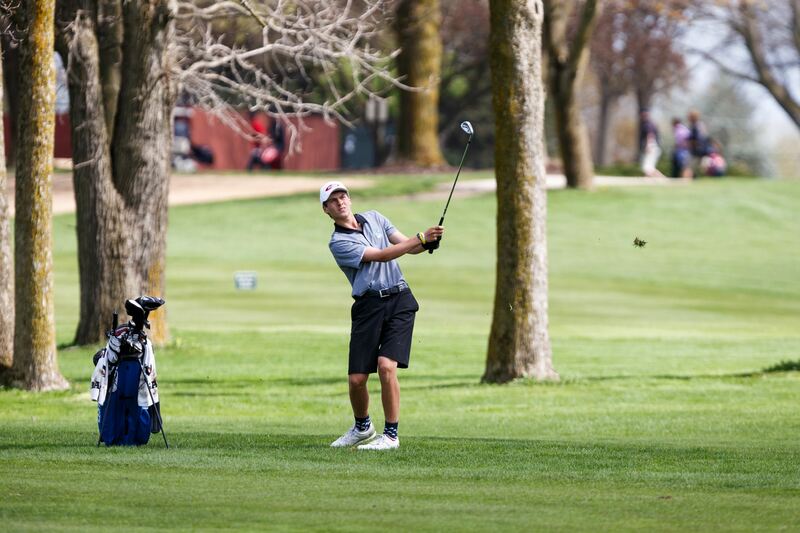 His first year at the WIAA State Golf Championships he finished tied for 67th, shooting a 20-over par 164 (83-81). But then he showed a big improvement last spring at state, finishing 17th, 10 over par, knocking 10 strokes off his score with a 154 (77-77). 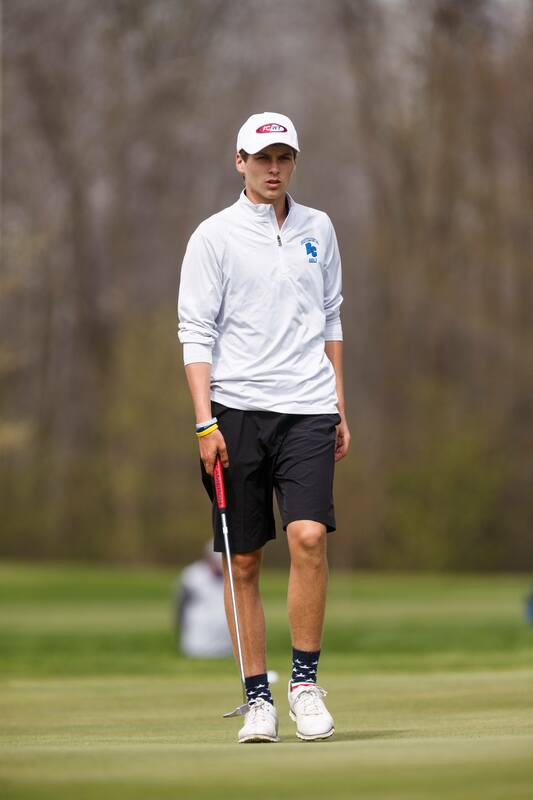 Anderson had an excellent sophomore season, earning first-team All-Greater Metro Conference honors, third team All-Area and honorable mention All-State, shooting a 74 in the conference championship. He was also named to the GCAW Academic All State team, showing he was talented on the course and in the classroom. He averaged 39.4 strokes and was named the Lancers Most Valuable Player. Anderson was pretty low-key when I asked what his strong points on the course were. "I'm pretty good with the irons and overall, keeping myself out of trouble, which can be pretty helpful most of the time," he said. "I like to motivate our team too." "He's not great at any one thing, but he is good at just about anything thing," he said. "He has good length off the tee. He hits his irons well. His short game is good and he is a good putter. So he is not excellent at any of those, but he is really good at all of them." But Anderson, being only a junior, has things to work on. "Definitely my short game - chipping, putting, 80 yards in and everything," he said. "I've just got to get to the next level. I really got to dial that in; any of those times I have a chance to make a birdie or par. If I miss the green, I would have a good chance of getting up and down then." Scrobel - on the other hand - was complimentary when talking on what he needs to improve on. Photo by Alan Herzberg, SportsPhotosLLC --- Coach Brian Scrobel says Jack Anderson isn't excellent at any one thing, but he is very good at every part of his game. "Consistency. I think his ball striking is good, but consistency on the golf course when you have a bad shot or a bad hole, being able to show the resiliency in bouncing back quicker and being able to manage those bad shots and the bad holes is important," he said. "I think this is a big year for Jack. We would like bad rounds of golf to be in the high 70's. That's a bad round of golf. He has the ability to go really low. You can always track people's progress - not necessarily as how low they go - but how high is their high. If they can keep their high scores manageable, that's good progress." Both Anderson and Zack Mindel are co-captains this season and Scrobel talked about Jack's leadership style. "Everyone likes him so it's easy for people to gravitate towards him," the veteran coach said. "With his success on the golf course - his success hasn't come easy - he really works hard on it. And I think the kids notice and they see how much time he puts into it. He leads by example and does a really good job that way." Jack was excited about his role as one of the Lancers captains. "I think it's pretty crucial, especially with guys who have their first year on varsity," he said. "I try to calm them down and let them know, that even if they play bad they're going to be OK.
"There's a lot of time where if you're in the wrong place mentally, it might even affect your swing. It's important to help yourself if you're in that position or if someone else is. Let them know they are better than what they are going through. It happens to everybody, you just need to get through it and overcome it. It might take time, but eventually you will through it." Anderson is not afraid to help them with the physical part of their game. "If I see something in their swing and I can help them out, I will jump right to it and help them out." Anderson surprised me when I asked him who his favorite professional golfer was and he responded "I like Tiger (Woods), he's by far my favorite. He was totally dominant. He just beat everybody. I watch videos of him. It's just crazy to see how good he actually was." Scrobel had an interesting comment on Anderson's makeup. "He has the type of personality that he's equality comfortable talking with his friends and peers as he is with adults - and that's a compliment," he said. "He's got great perspective on life. He has great humor. Although he likes to have fun, he's also very mature." With Anderson, Mindel and Jack Sonsalla leading the way, the Lancers sound have an opportunity to return to state this season. Scrobel then talked about the mental part of the game and how it helps the physical play of the team. "Oh yeah absolutely. To be successful in conference, you need to have success 1-5," Scrobel explained. "If the 4-5 players play (well), the more relaxed our 1-2-3 will be. If they're more relaxed then they're scores are going to go down. As their scores go down, it was be easier for the 4-5. It's cyclical. As soon as you see the better players in the lineup really start to feel comfortable and playing to their ability, everyone will play more relaxed." Which is good news for Anderson and company. FAVORITE PLACE YOU VISITED: ​Arizona. MOST MEMORABLE MOMENT: Going to the state tournament as a freshman and shot a 76 in the sectional. WHAT DO YOU WANT TO DO IN THE FUTURE: Attend college, play golf and study finance. Looking to be an Investment Banker.